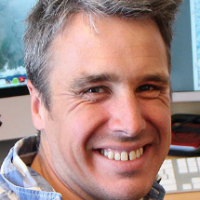 Use Twitter to communicate your research! Use social media to explain your latest results! Most scientists have probably heard similar advice over the past few years. The advice makes many scientists shiver a little with apprehension. Some scientists apparently shiver more than others and have made their views very clear. Nordic PhD students are also slightly skeptical about using Twitter, and would rather that communication specialists take responsibility for communicating their scientific findings. This apprehension is justified. Some of the tweets I have posted via @climatesnack have met rather nasty responses. I didn’t feel obliged to reply to the person that called me an “ignoramus” when I posted something about science poetry. That conversation ended swiftly. But some conversations can be very useful. On Twitter there are conversations both useful and useless to your scientific work. Just like in real life, on Twitter you can chose which conversations you want to leave; you can chose which conversations you want to be a part of; or you can chose which conversations you just want to listen to. And here’s where I think Twitter is really powerful. If you want, you can just listen. For me, I don’t often use Twitter to communicate my research to the outside world. First and foremost, I use Twitter to listen and to learn. I learn about new scientific papers. I learn about organizations that have similar scientific interests to me. I learn about happenings at conferences I wish I had funding to attend. I listen in to the conversations on Twitter and I learn! But how do I find the conversations that might be useful to me? We have a helping hand in social media. It’s called the hashtag. Hashtags really irritated me before I started to understand how powerful they can be. A (responsibly-used) hashtag can guide you to incredible amounts of interesting information. Let’s take science communication as an example. As you may imagine, science communication is a field where researchers know how to use social media. One of science communication’s main hashtags is #scicomm. Search for it in Twitter, Facebook or other outlets and you’ll quickly see how much relevant information comes back. When it comes to more traditional scientific fields, several have well established hashtags that can guide you to useful stuff. For example, a search for the hashtag #geoscience returns almost solely tweets related to Geoscience. But sometimes seemingly relevant hashtags give you irrelevant information! A lot of my research focuses on monsoons, so I would love to access all sorts of useful information about them. However, when I search #monsoon I do not get much research-based information in return. Today I found out that someone is selling clothes from the shop #Monsoon on eBay; that wedding photos are best if you get married during the #Monsoon; that the band called Tokio Hotel has a song called #Monsoon; and that the #Monsoon is here so I should book a room at the Crowne Plaza. Some of this might be useful information for someone, but not for me if I am interested in monsoon research. 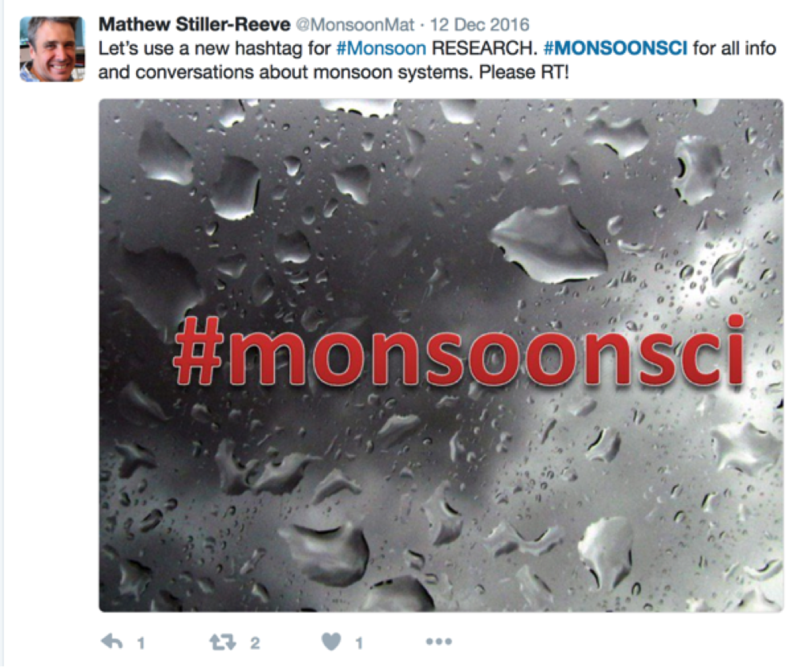 Monsoon research lacks a solid hashtag to rally around. Maybe your research fields do too. But this is where we can be pro-active. Create a hashtag that represents your field, which is not used elsewhere and promote it. I therefore recently suggested #monsoonsci. I embedded a photo in the initial tweets and tagged several #monsoonsci researchers and organizations. So far, some people have started using it in the field. It’s important that I keep using it and promoting it for a while, before it starts to live a life of it’s own. We’ll see how it goes. For us to get the most from Twitter (and other social media), we need to stop thinking about it as a one-way communication tool to tell the world about our research. We need to think about it as a way to learn new things through conversations with people we want to converse with. Just like in real life, we find the conversations we want to have, we join in, and we learn. The more you put into social media conversations, the more you will get out. However, you can use Twitter simply as a learning tool, without tweeting a single thing. It can be that simple. The challenge is finding those conversations you want too listen to! Tagged monsoon research, monsoon research hashtag, outreach, research and social media, scicomm, science communication, Social media in science, Twitter in science.